It may be, as Julia Azari recently argued, that there is no good reason for Bernie Sanders to get out of the Democratic race for the presidency. As she notes, what little research there is on the topic suggests that lengthy primaries probably don’t hurt the nominee’s general election chances. This is in part because it is policy differences, more than the contentious nature of a nominating contest, that divides parties. Of course, as Azari acknowledges, researchers are generalizing from a very small sample, and many of the comparisons the media makes are to the 2008 presidential race which, as I argue below, may not be a very relevant example. In any case, I suspect that Azari would agree with me that if Sanders isn’t hurting Clinton’s general election chances by staying in the race, he’s probably not helping them either. It’s long past the point where one could argue that he’s sharpening her debating skills, or helping her develop explanations for policy stances or to defend past actions (speaking fees anyone?) Whether you believe Sanders is staying in because he actually has a shot at the nomination, as his fervent supporters believe , or because he’s fighting for the soul of the Democratic Party – neither objective seems all that compatible with Clinton’s goal of closing this nomination out and pivoting toward the general election. Of course, Sanders’ supporters will point out that Clinton stayed in the race for the duration in 2008, only conceding after the last primary was held. But Sanders isn’t Clinton, and this isn’t 2008. Eight years ago Clinton was viewed, for the most part, as slightly less liberal than Barack Obama by most Democratic voters, although these ideological placements varied a bit as the campaign dragged on. To the degree that this influenced Obama in a very competitive nominating contest, she served as something of an ideological anchor, preventing him from moving too far to the Left. In 2016, however, the perceived ideological gap between the two Democratic candidates appears larger. According to exit polls, about 2/3 of the roughly 30% of Democratic voters who favor more liberal issues support Sanders, whereas Clinton won 70% of those who want to see a continuation of Obama’s policies. This suggests that to the extent that issues matter, he’s been pressuring her from the Left of the ideological spectrum, as evidenced by her repositioning on issues like trade and social security. 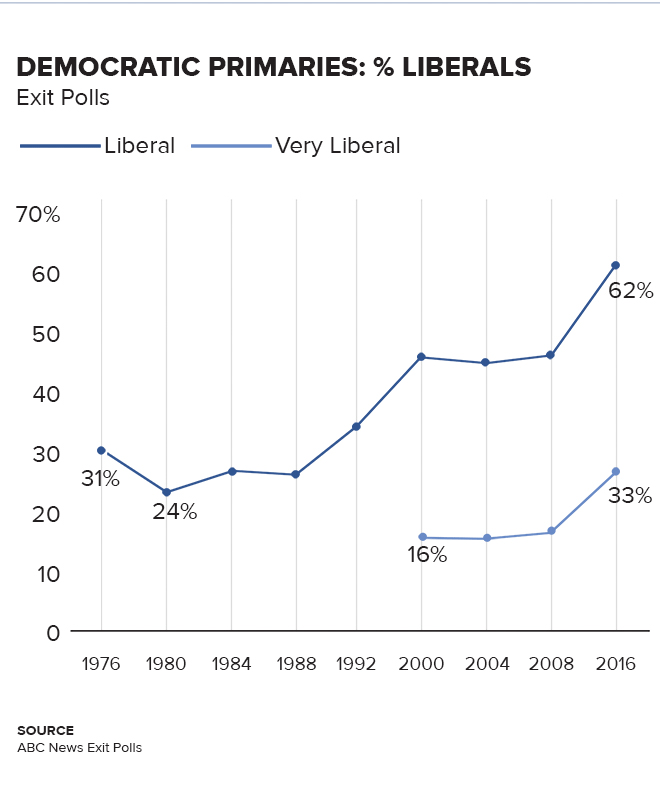 Moreover, there’s been a big influx of self-described liberals voting in the Democratic nominating process, compared to eight years ago, which has made it more likely that Sanders’ ideological positioning will exert some pull on Clinton’s policy views. More importantly, however, in 2008 there was no doubt that both Obama and Clinton were mainstream Democrats, whose ideological views were shared by most Democratic voters. This is not the case in 2016. According to research by Middlebury College’s Kate Reinmuth, Sanders has beaten Clinton among self-identified Democrats in only two primaries for which we have exit polls: those in his home state of Vermont and in neighboring New Hampshire. In the remaining 17 nominating contests (again, for which we have exit polls), she beat Sanders among Democratic voters in every one. Here is a table created by Reinmuth showing how Sanders has done among Democrats versus Independents. Among the approximately 70% of voters self-identifying as Democrats, Sanders wins less than a third of the vote, on average. 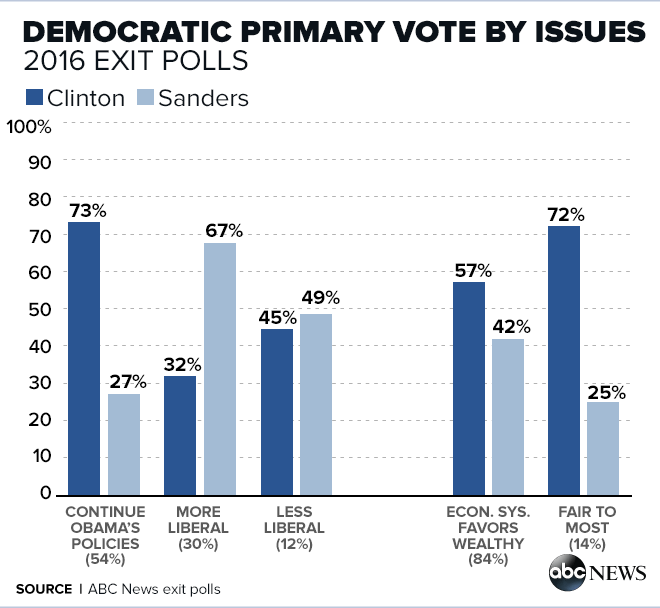 In contrast, among the roughly 25% of voters who are independents, Sanders wins about 60% of the vote, according to exit polls. That pattern, by the way, continued in the West Virginia primary. Although Clinton lost the primary to Sanders decisively, 51%-36%, she again beat him, 49%-45% among the 56% of West Virginia voters who self-identified as Democrats. Given his middling support among rank-and-file Democratic voters, Sanders may be less concerned about the impact of his staying in the race on Clinton’s chances than if he were a more traditional Democrat. To be clear, I have no doubt that Sanders is sincere in wanting to defeat Trump in November. But to the extent that he is playing a longer game, one whose end objective is remaking the Democratic Party in a more progressive image, one could see why he might calculate that it is worth fighting for every last delegate, even if it does make it more difficult for Clinton to pivot to the general election. Given the clear generational disparity in their respective coalitions, Sanders may believe he represents the future of the Democratic Party to a much greater degree than does she. Ideally, of course, Sanders hopes to accomplish both goals: defeating Trump in November, and repositioning the Democratic Party in a more progressive direction in the years to come. And to be fair to him, it is not clear that those objectives are incompatible. But to the extent that they are, I suspect many of his followers would urge Sanders to remain true to his progressive principles, and to fight the good fight through the remaining contests up to the convention – even if it harms Clinton’s general election chances. Indeed, a recent NBC poll indicates that 89% of Bernie supporters want him to stay in the race, compared to only 28% of Clinton supporters. Of course, Sanders’ supporters aren’t the only ones urging him to stay in the race. Donald Trump recently tweeted that Sanders should continue competing for the presidency – even if it means running as a third-party candidate! Bernie Sanders has been treated terribly by the Democrats—both with delegates & otherwise. He should show them, and run as an Independent! It may be the only issue on which The Donald and FeelTheBern crowd agree. For local listeners, I’ll be on Vermont Public Radio tomorrow to talk Bernie – send in your questions now! Both Trump and Sanders run on anti-establishment platforms. Let’s discuss this in a more thoughtful way and also connect it to voter age disparity. Rick – What, exactly, do you want to connect to voter age disparity. Are you referencing the age disparity in Bernie’s and Hillary’s supporters that I document in the post? Or between Trump’s and Sanders’ supporters? 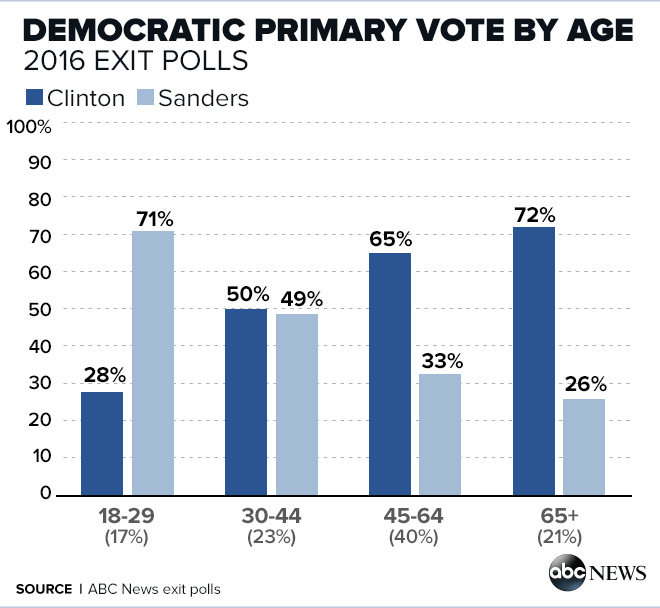 Two things: yes, voter age disparity between Hil and Bern reflects a time-honored young vs. old theme in human history and US politics. And yes, this voter age disparity also reflects a broader ‘change’ theme that’s is borne out in Trump and Sanders campaign rhetoric/vibe. It speaks to a collective ‘agreement’, if you will, that we need to continuously evolve via marked change for better or for worse. I agree with your broader point. So here’s the question: how many of Bernie’s “change” voters will support Trump in the general if Bernie doesn’t win the nomination? …Hence my non-judgmental use of “for better or for worse”. Based on how I framed it, if it’s accurate, one might conclude some Bernie supporters will vote for Trump or not vote at all.